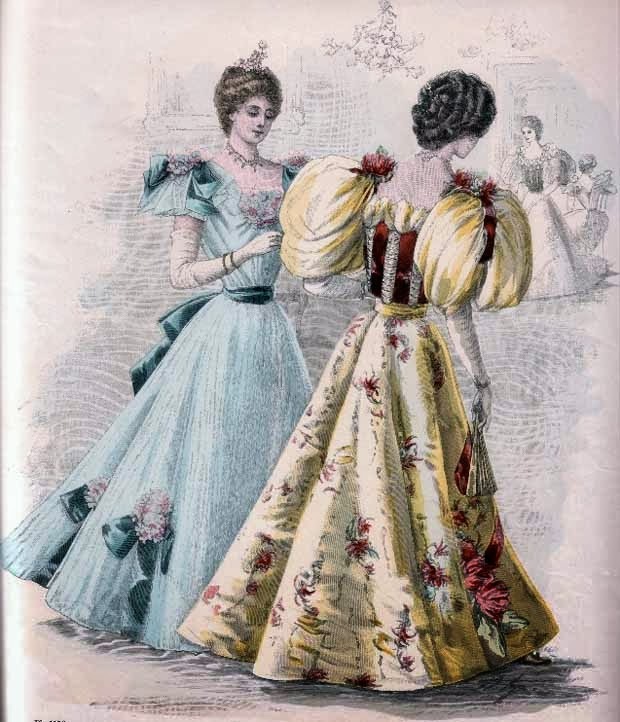 In the 1890s, the era of the bustle skirts had faded away. 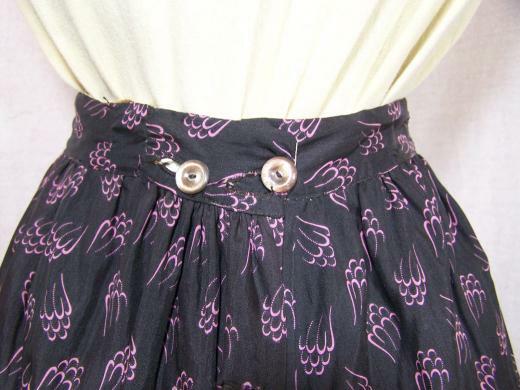 Instead, skirts became fitted closely to the waist but full along the hemline at the back. This look was achieved by making the front panel A-line in shape and the back panel shaped like a semi-circle. Because of the way the skirt fanned out at the back, often falling in natural pleats, it became known as the “fan” skirt. 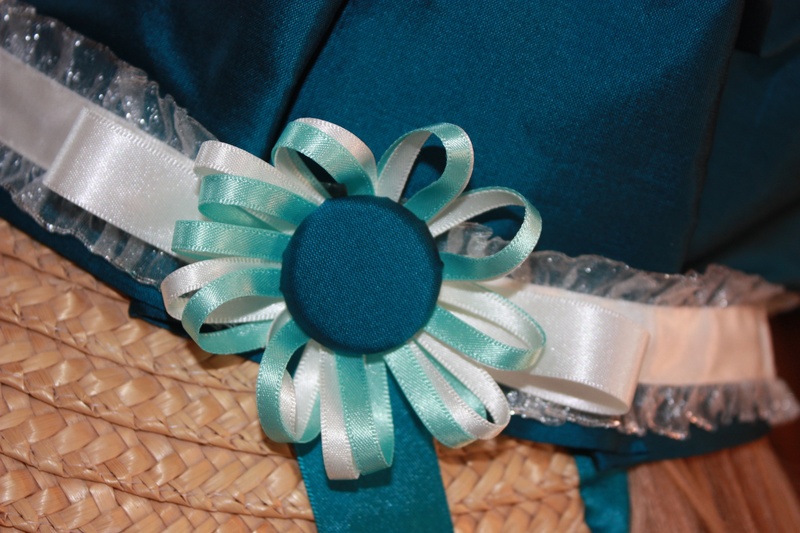 There were many other skirts of similar design that were used during this period, all called rather unique names. 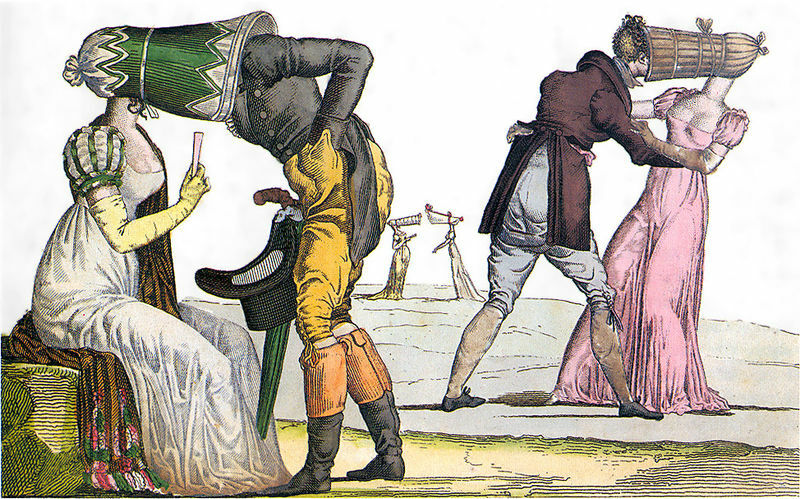 Janet Arnold provides some of the names in her book, Patterns of Fashion 2, and they include the “Bell” skirt, the “Restoration” skirt, the “French” skirt, the “Rejane” skirt, the “Papillon” skirt, and the “Umbrella” skirt, among others. Essentially they were all the same in that they were fitted at the waist and full at the back hemline. 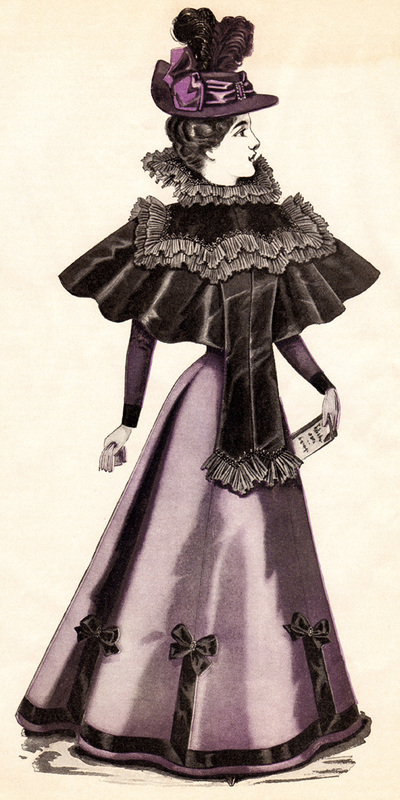 A fashion plate from 1896. 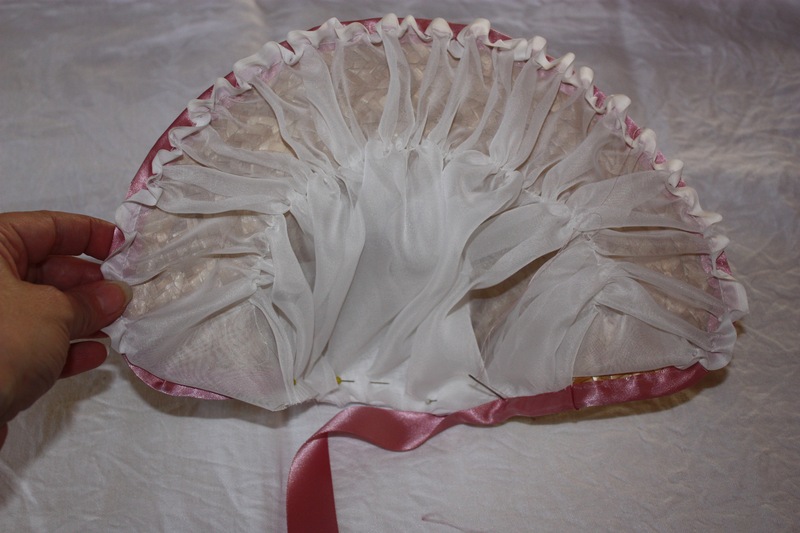 The way in which the back of the “Fan” skirt spread out when moving made it a very pretty skirt for ball dancing, and for this reason I have been very keen to make one of my own. Unfortunately for present-day dressmakers, many of these types of patterns and the accompanying instructions that have been extracted from historical sources presumed a fair bit of knowledge on the contemporary reader. For instance, there is no instructions about what sort of a waistband to construct or how the back or side fastens, especially when there is no allowance for a placket. In the absence of this information, I have had to look at extant examples to discover what sorts of waistbands and fastenings were used during this period and do my best! 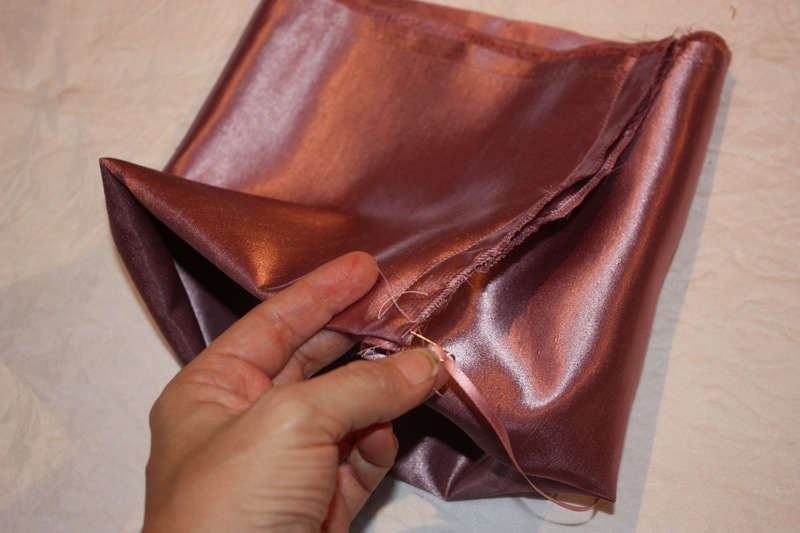 One beneficial inclusion in the sewing directions is the precise instructions of how to make the garment to your own figure. However, the instructions also presume the wearer will be using a corset and has a relatively small waist measurement. (The pattern uses a waist size of 24″ as an example.) 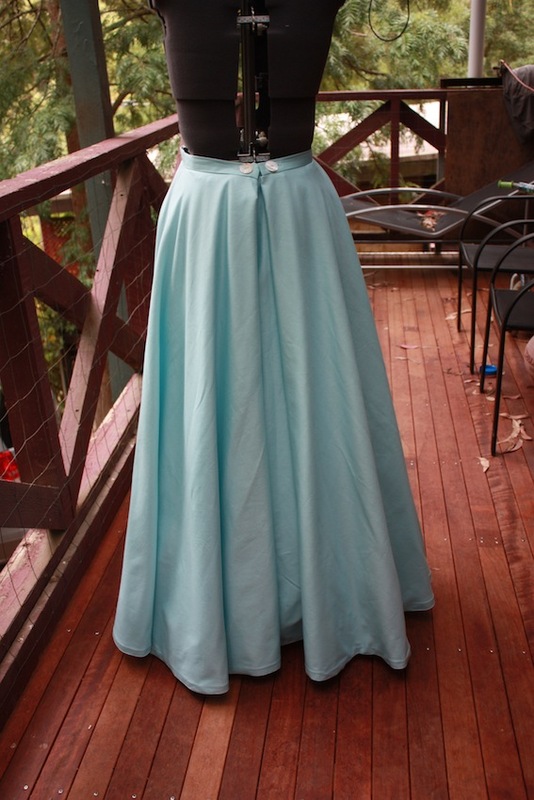 I wanted to make this skirt to my uncorseted waist size and, whilst I still used the sizing instructions, I found I needed to adjust them a little when using a much larger waist measurement. 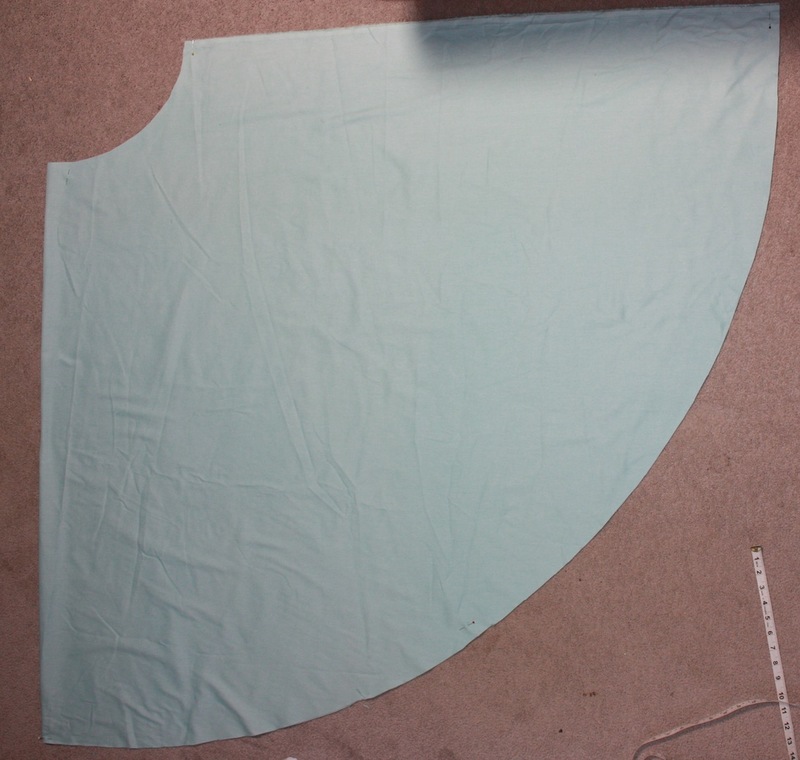 Basically I just applied the measurements to the cloth and then cut out the fabric, allowing a little extra for the seam allowances. 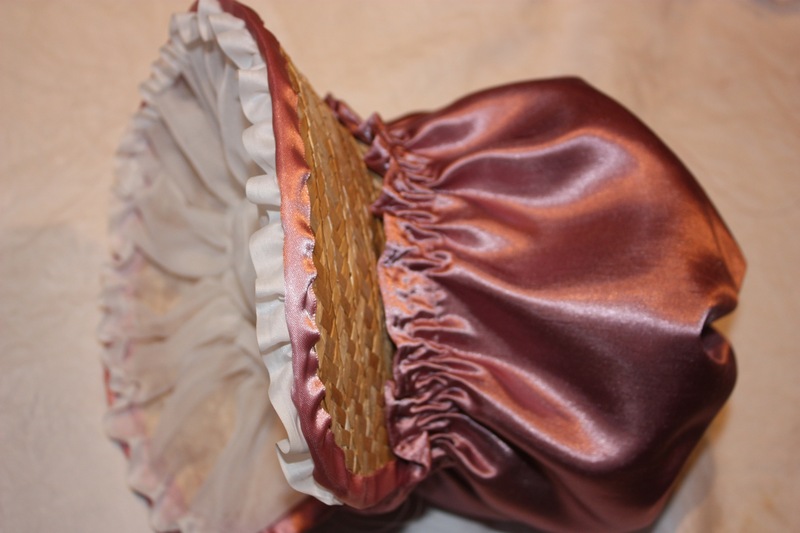 The front panel of the fan skirt, centre front on the fold. 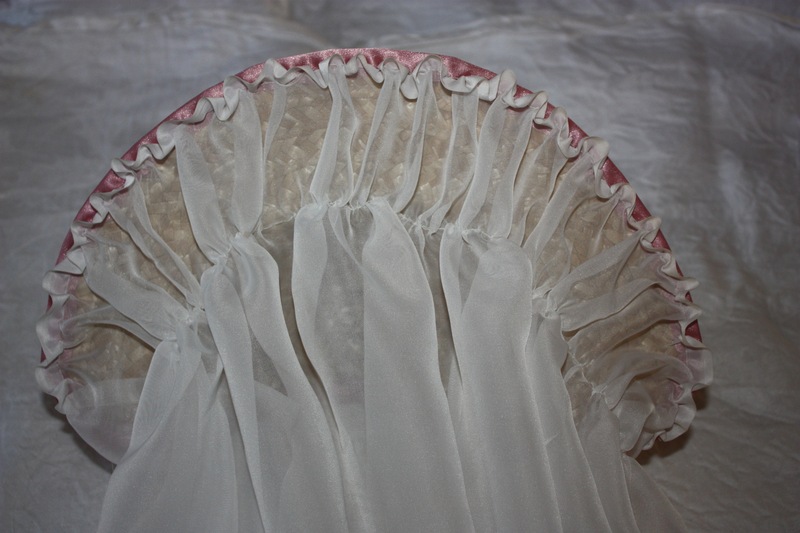 The back panel of the fan skirt, with the centre back on the fold. 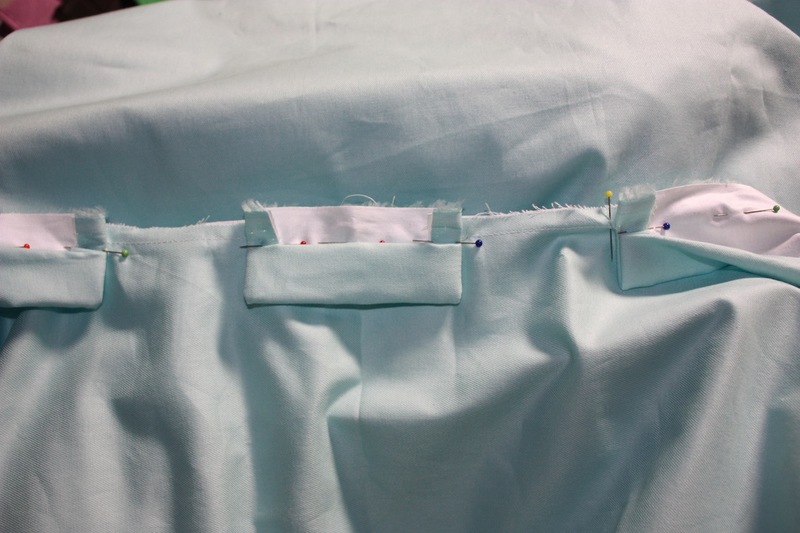 For the outer fabric I used a soft thick cotton (woven similarly to drill) and for the lining I used cotton broadcloth. Step One: Sew the side seams. Here, I treated the lining and the outer fabric as one. This made the fabric thicker and helped it stand out properly. Step Two: Make two darts in the front panel at the waistline (one on each side). I also made two darts on each side of the waist, near where the back panel meets the front panel. You can see the darts in the photos below. Mine are a bit dodgy and I think I will need to go back and fix them. Step Three: I was initially going to make a basic waistband which fastened at the centre back, but where to place the placket really baffled me, especially since the centre back was on a fold. In the end, I changed the design of the waistband, using this extant example as a guide. 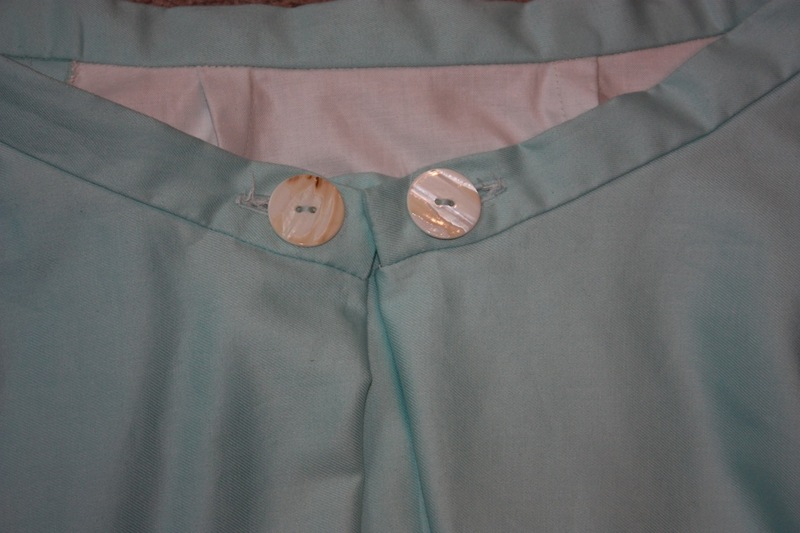 This skirt appears to still have a back placket and the centre back edges overlap and fasten with two buttons. 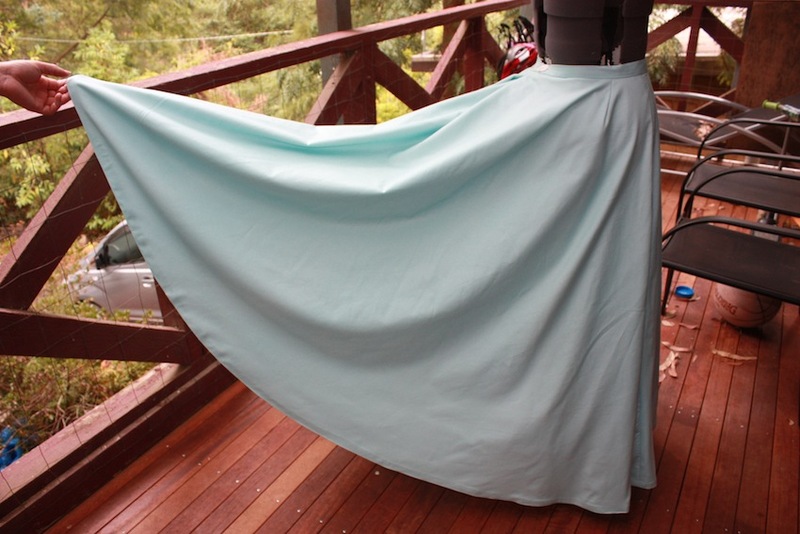 This skirt has a lovely pleated back, where two pleats fold to meet each other at the centre back. So, using these two ideas, I developed a way to have a centre back opening without the need for a placket. 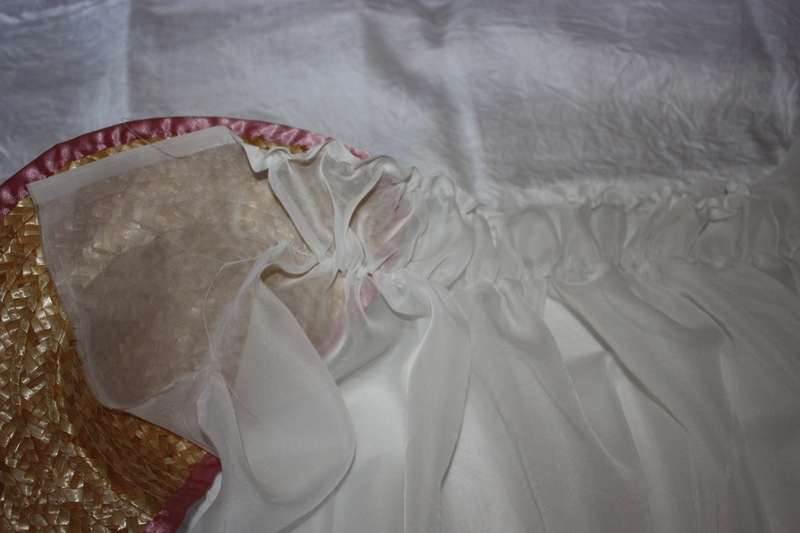 Most extant Victorian skirts I have seen have plackets, so I am unsure of exactly how they were done in this case where the centre back is on a fold and the side seams are so close to the front of the skirt. The waistband is in two parts; the normal waistband is cut to reach almost all the way around to the centre back but there is a second waistband “tab” in the centre back which the sides pull in and attach to. This creates a pleat in the centre back. The finished back closure is pictured below. 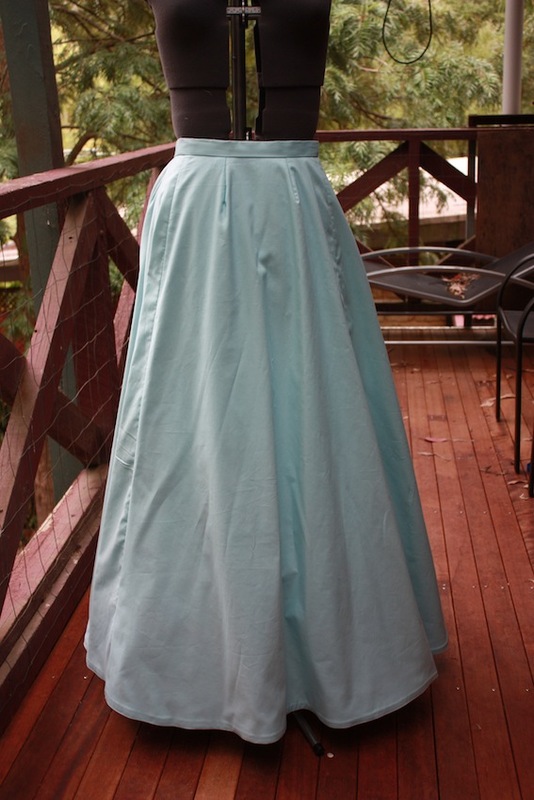 It is not what I would call strictly historical, as most Victorian skirts had plackets and were generally fastened with hooks and eyes, but I am happy with it nonetheless. 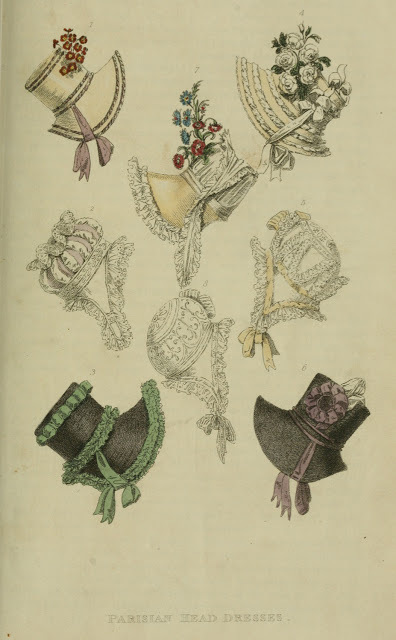 If you are interested in looking at the way other skirts of this era are fastened, I have since found that Nancy Bradfield’s book, Costume in Detail: 1730-1930, has several drawings of extant garments from this period with different types of fastenings. 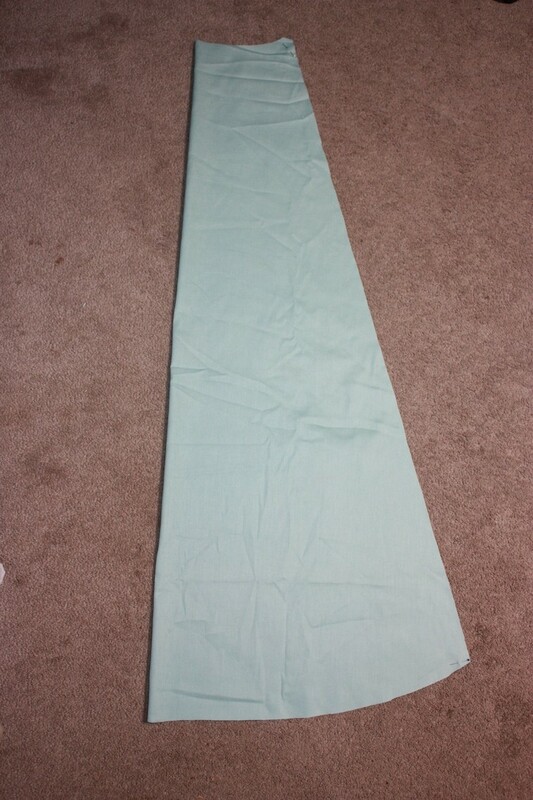 Step Four: Then the skirt just needs to be hemmed. Side view, with the fullness of the back held out. It was really a fairly quick and easy sewing project to make. I have been thinking about also adding two tabs onto the waistband that I can tie in to make the skirt wearable with a corset. All that would change in the appearance will be that there will be an extra set of pleats at the centre back. I am looking forward to my next dancing evening now! 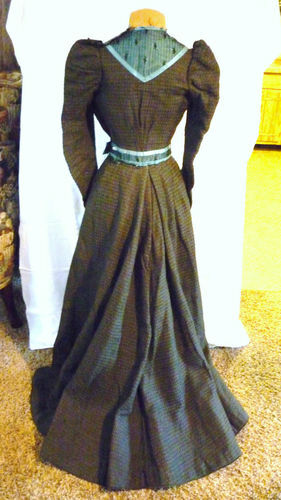 I have since made a matching 1890’s bolero jacket for this skirt. 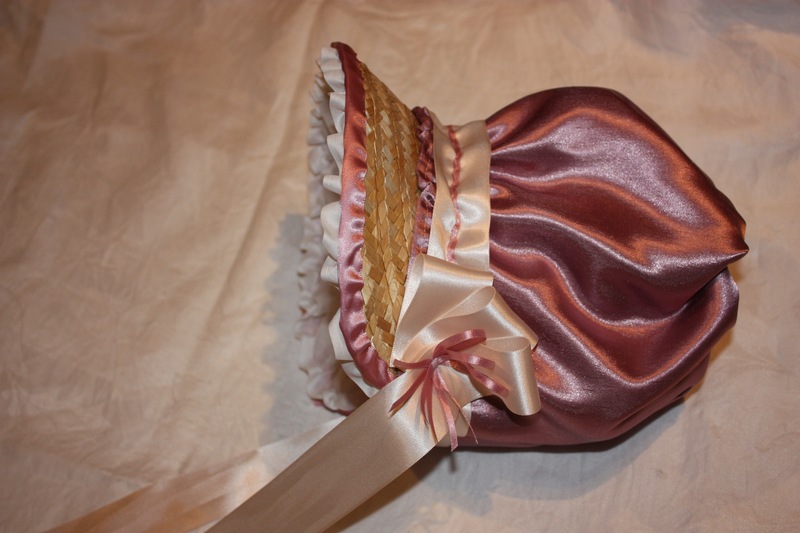 At the Jane Austen Festival in 2013, I did a workshop on making a bonnet from buckram. 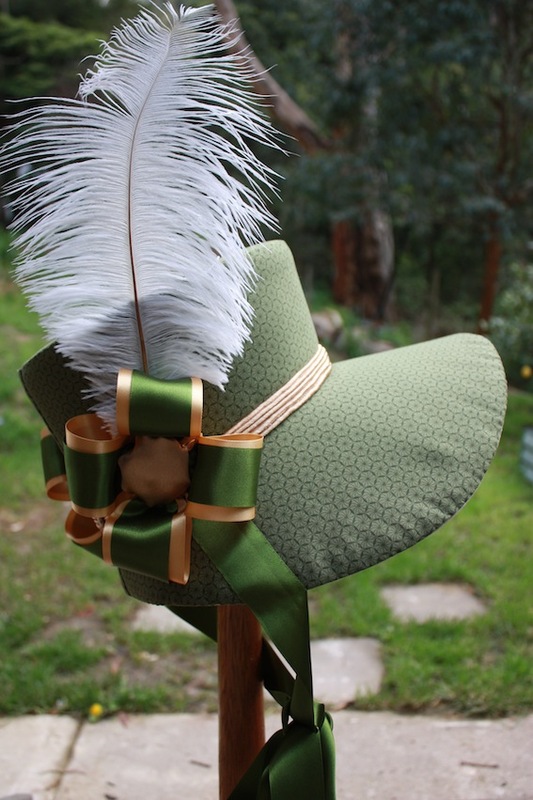 I have always wanted to do more millinery but have struggled to know where to start without proper tuition, so this workshop was very exciting for me! 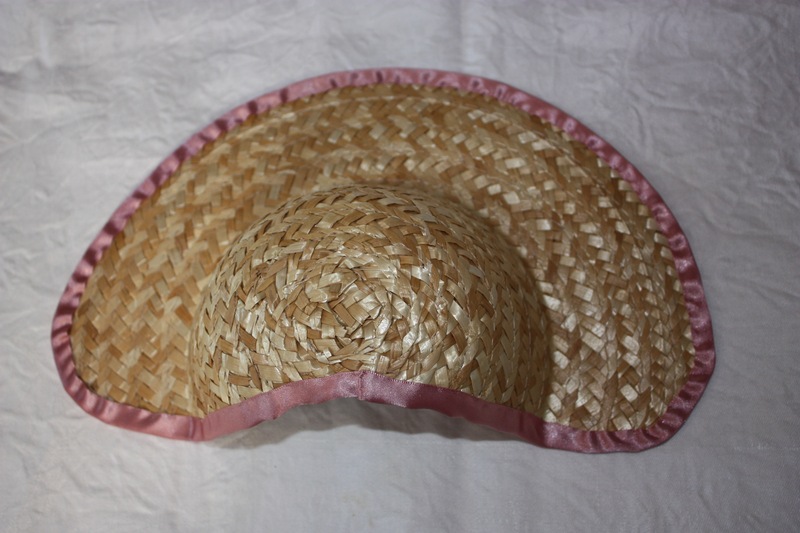 The pattern was of a late Regency bonnet, circa 1817, and was provided as part of the workshop. The basic materials (buckram, wire, and pellon) were also provided. 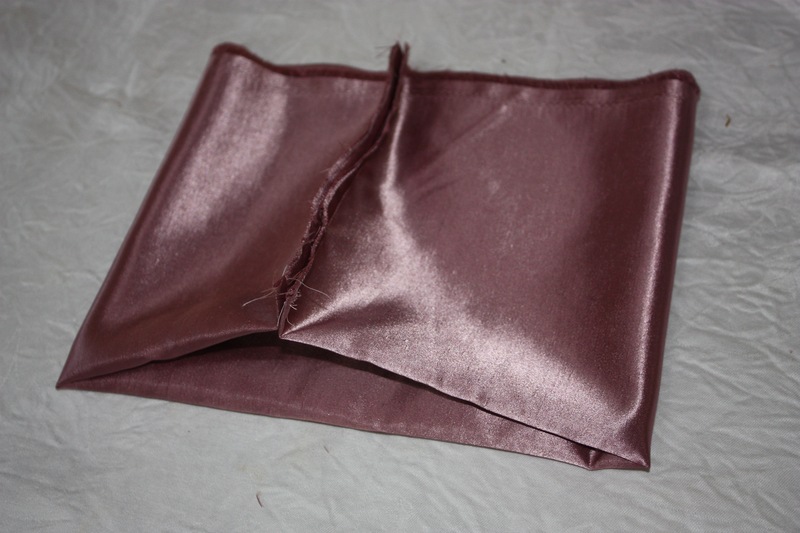 We were set to work handsewing the strips of metal wire to the edges of the buckram. 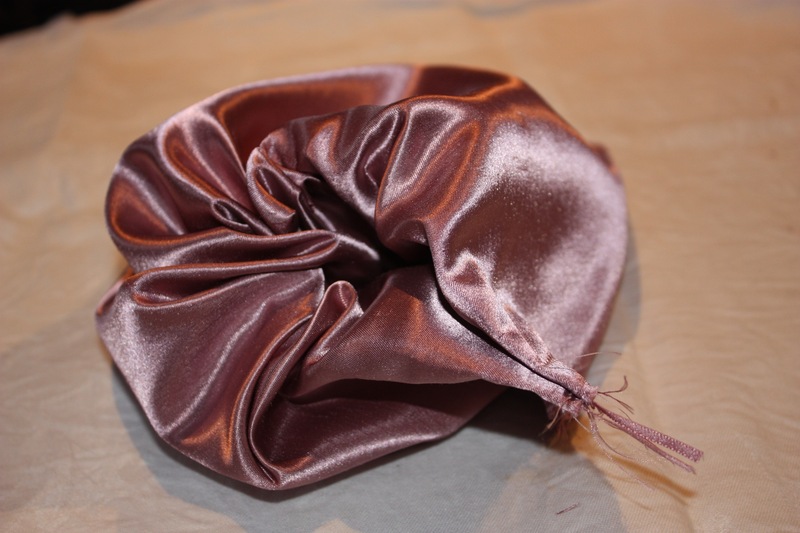 In millinery, the buckram is cut to the desired shape and the wire is used to hold the buckram in this shape. For this reason it is important to pre-shape the wire to the desired shape before attaching it to the buckram. 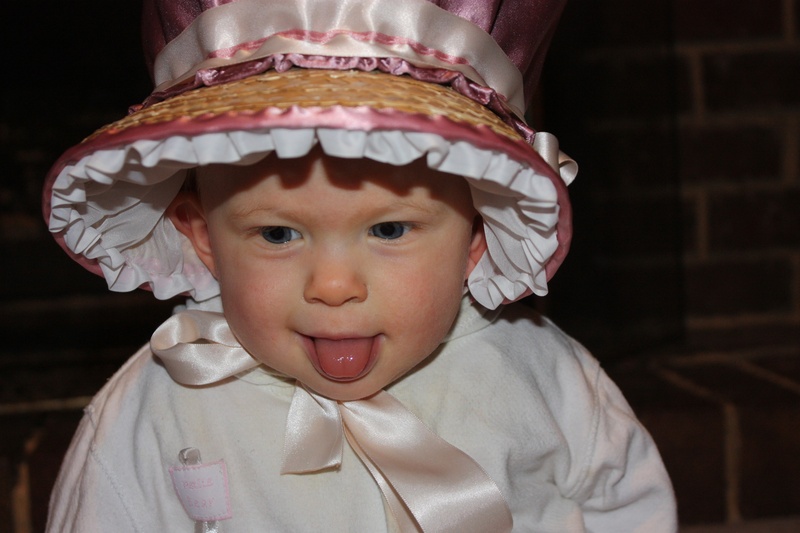 It is also important to double check that the part of the hat that sits on the head will fit your head! 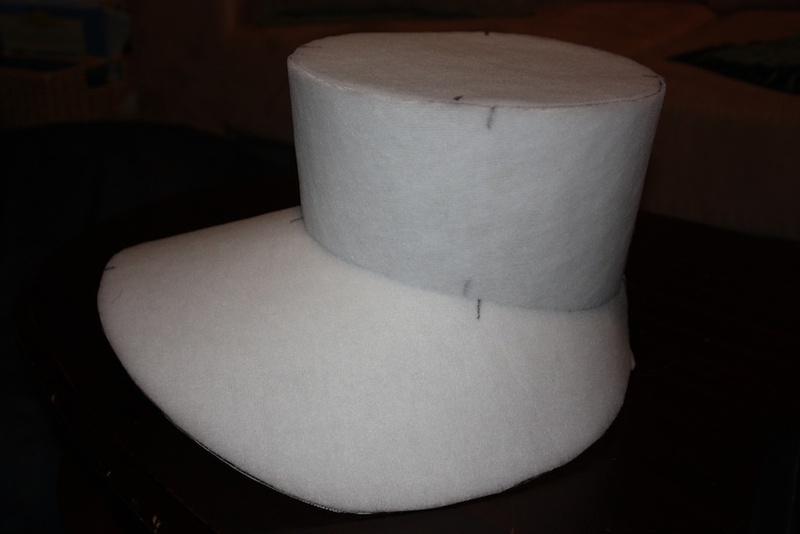 The buckram crown and brim, partially assembled. This is as far as I got in the class. Once I got home, I sprayed the assembled buckram frame with a spray-on adhesive and stuck the pellon (thin layer of padding) to it. 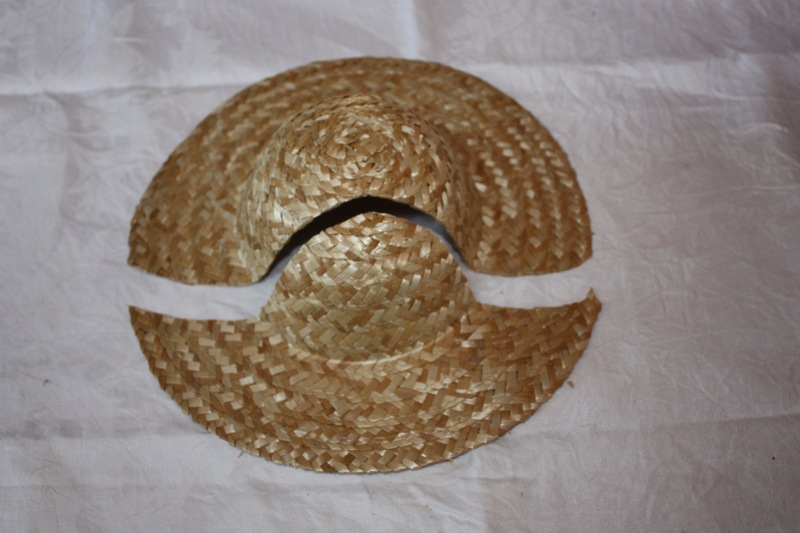 The pellon pieces covered the entire outer sections of the hat, as well as the inside brim area. The inside of the bonnet had no pellon. Then the fabric was cut out and handstitched to the frame. 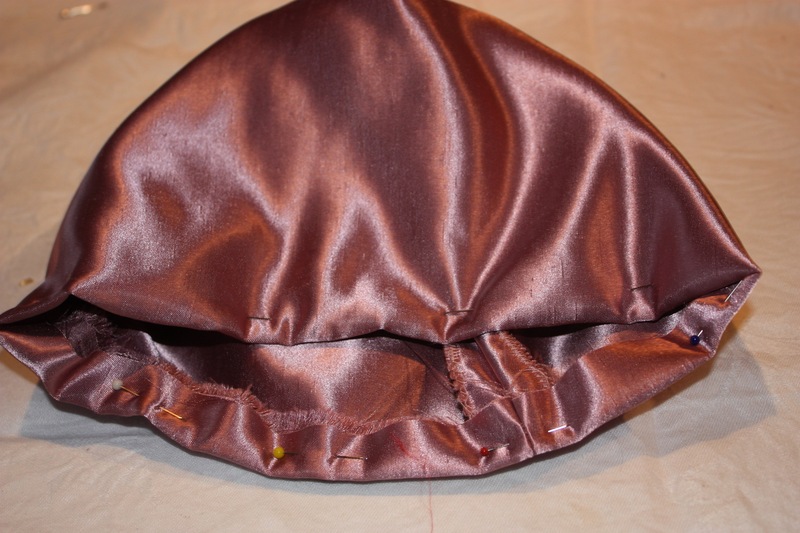 The fabric was cut out in 6 pieces: the outer top, the inner top, the outer side, the inner side, the outer brim, the inner brim. The fabric I chose for the inner sections was different to the fabric I chose for the outer sections, thereby creating a contrasting lining. Then I decorated it. The trimmings were all sewn on by hand after the hat was finished. This means that the trimmings can be easily removed and replaced later to create a new look. The piped band and ribbon flowers were both made by me (the links are below), and I obtained the ostrich feather from my local craft store. 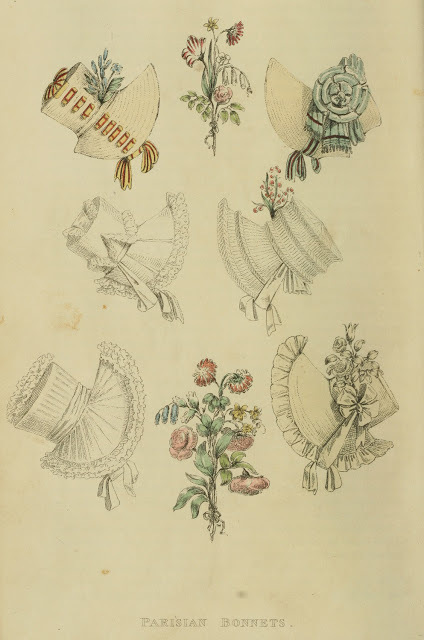 These pictures from Ackermann’s Repository helped provide ideas of how these bonnets were trimmed at this time. 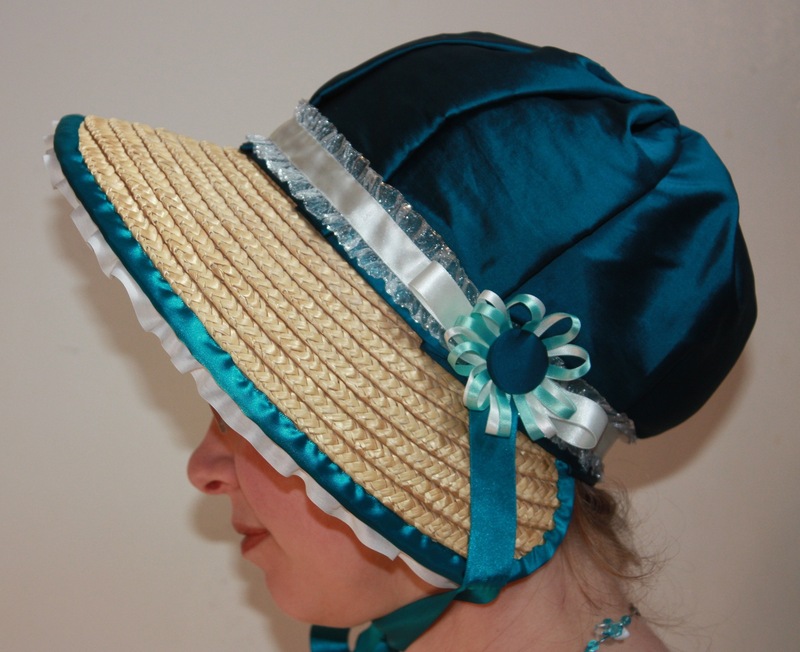 I particularly wanted mine to match the Regency spencer I have just finished. 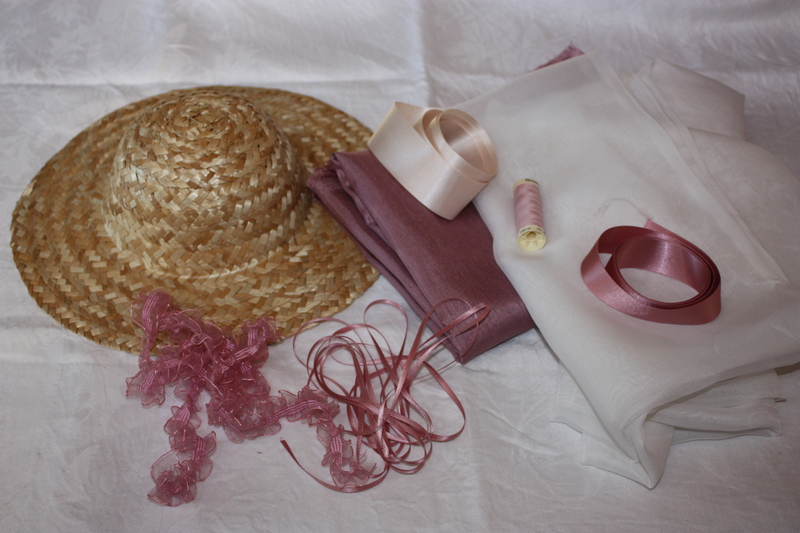 Now I have a lovely bonnet-and-spencer ensemble! 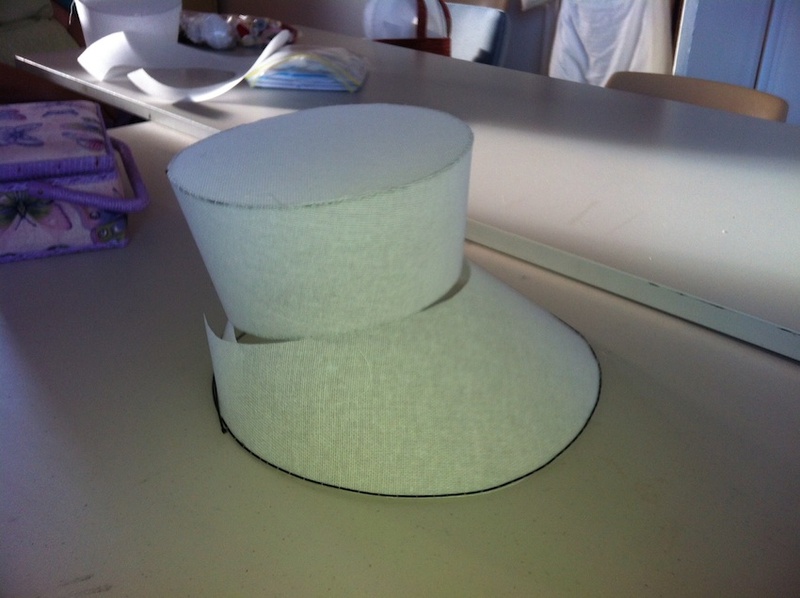 For my first-ever buckram hat, I am pretty pleased with how it turned out. I really loved the opportunity to work with buckram because the skills I have acquired give me so much more versatility to my hatmaking. 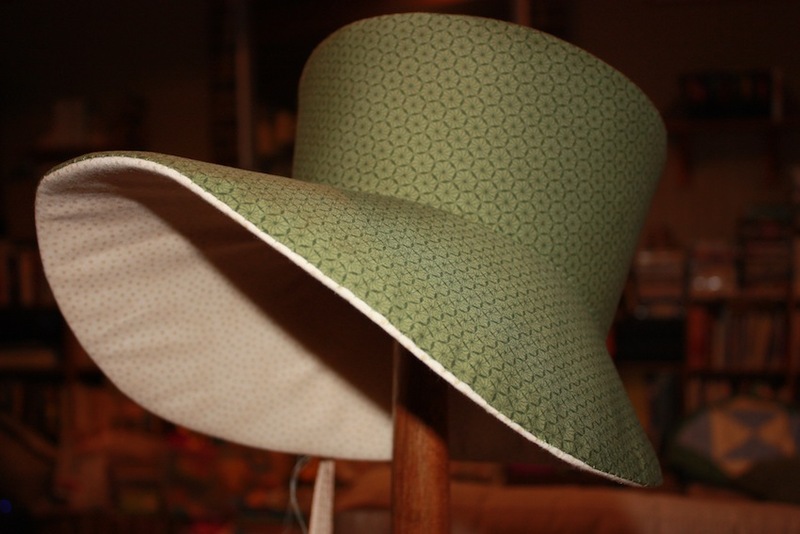 Now I am able to purchase other hat patterns or draft my own to make my own range of hats. Hats are my cup of tea! From the Neck Up: An Illustrated Guide to Hatmaking, by Denise Dreher – this book has many ideas for hat patterns, as well as construction steps and decorating ideas.